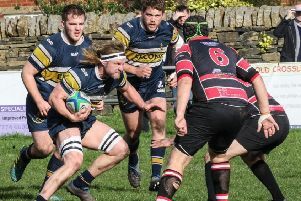 Heath are awaiting news of their Yorkshire Shield semi-final opponents after their 37-12 win away to Yorkshire One rivals Keighley under lights on Thursday. Coach Dave Harrison gave starts to Mark Puttick, Chris Piper and Dave Skinner in the pack whilst there was a welcome return on the bench for centre Sam Gill, signed a couple of seasons ago from York but injured in his debut. Heath took the lead after five minutes in front of a decent crowd on the artificial pitch at Utley when a clever grubber kick from Dan Cole was pounced on by the flying Si Brown for an unconverted try. Winger Callum Harriett-Brown was halted just short of the try-line while Dave Skinner made a crucial cover tackle at the other end. Heath began to take charge, with Matt Beasty controlling line out ball, and it came as no surprise when the Halifax side increased their lead after 30 minutes when Fergus Marsden drove over and it remained 10-0 until half-time. Good work from Cole and Ezra Hinchliffe enabled Jason Merrie to burst through a rather static home defence to score under the posts two minutes after the restart. Hinchliffe added the extras but Keighley responded immediately with a converted try to make it 7-17. The visitors were dominating but Keighley continued to battle in defence. Constant pressure produced a try from the hard working Chris Moore on the hour mark. Keighley made mistakes and gave away a stream of penalties. Following excellent scrummage work. Ian Downsborough controlled the ball to score a converted try. Hinchliffe went under the posts for Heath’s sixth try but Keighley scored an unconverted try with the last play of the game.